Never happier than when she's sewing; Jackie Wills is a Textile Artist working from Torquay with an international following. Her artistic career spans over 30 years with more than 1000 commissions. The Shorely spoke to Jackie about her life, inspiration and work. The wilds of Torbay's great outdoors are apparent in all of Jackie Wills work. Her stitches are as free flowing as the sea, her colours are as bold as the red rocks and her bold patterns as abundant and complex as those we see in the nature around us. Jackie began her career back in 1984. She picked Mayfair, London as her starting point -literally choosing this location off her family Monopoly board - and her passion and persistence paid off with her first commission coming from Charles Hammond on Sloane Street. 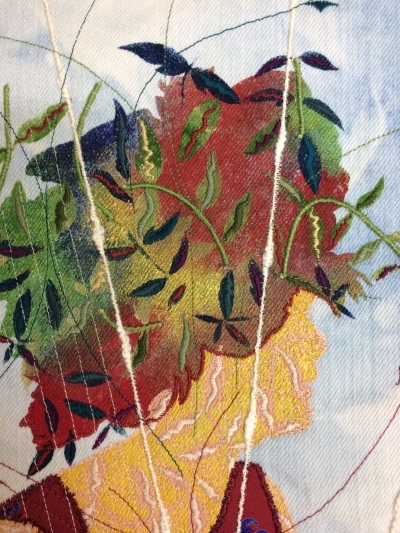 What followed was a career spanning three decades, firstly in London at an interior designers, then returning to Torquay as an established textile artist. During the late 1980s, Jackie began teaching at workshops in Devon and America and sold her work at galleries, shows and events. Her time at Cockington Court led to an accidental new outlet for creativity - taking the humble waistcoat and transforming it into an artistic canvas of beauty and storytelling. In 2010, Jackie was commissioned to create a waistcoat for VOGUE and since then, has sold over 850 waistcoats, each being uniquely reflective of the story Jackie develops with the wearer. Jackie's other passion is contemporary patchwork. 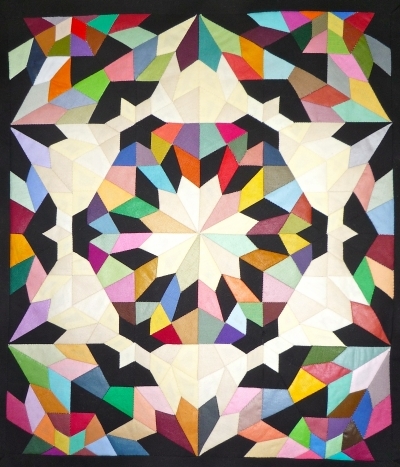 Her use of the mind boggling Fibonacci sequence of numbers to create patchwork quilts, has seen her featured in magazines, like 'Patchwork and Quilting' and 'Quilt World' and publish two books. Jackie is a true creative entrepreneur, perfectly balancing her artistic endeavours with a well executed business. Her online business, selling ready cut patchwork paper templates and instructional guides has a global fan base. It is perhaps her greatest and hardest patchwork, the islamic pattern and work she titled 'Mascara' that peaked interest from the Crafts Council, where she is now featured as part of their nationally recognised directory. Jackie continues to work and play hard - her love of swimming continues with daily dips (even in winter!) in the sea and local rivers. Her textile art of friends splashing and swimming in the waters perfectly capture Torbay's great outdoors. You can see these and over 80 waistcoats and patchworks in her studio, just a short walk from Torquay seafront. Well worth a visit. Discover more about Jackie Wills on her website. She welcomes visits to her studio throughout the year - just contact her to book your visit. You can also learn more our patchwork and pick up her paper templates at the Patchwork Templates website.